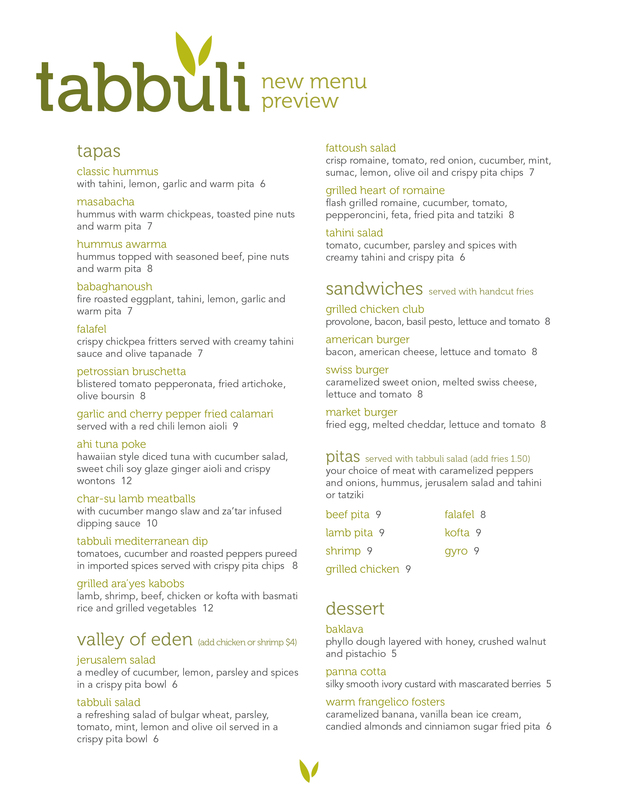 Stop in tonight to try new Tabbuli menu items! The weather is mild and Tabbuli’s patio is beautiful (and has heaters if necessary!) – stop in and try out our new food! If you haven’t made your plans yet for a romantic Valentine’s dinner, Tabbuli has you covered. The weather is clearing up downtown and the chance of rain has shrunk to almost nothing – it looks like it will be a fabulous evening for a romantic dinner for two on our patio – one of the best outdoor dining locations in downtown Charleston! Shrimp and lump crab stack with thin sliced cucumbers, golden beets and fresh avocados with a roasted red pepper and cilantro aioli. Grilled chicken satay and fresh jicama salad with a Thai peanut reduction. Fresh rosemary and thyme braised lamb shank served with Mediterranean couscous. Call us for reservations at 628-5959. Tabbuli offers a variety of Mediterranean dishes – and great drinks too! [slideshow]Love is in the air and Tabbuli wants to help set the mood for you and your sweetheart. No other restaurant downtown has patio dining with the atmosphere that Tabbuli has. Join us on our romantic patio for a Valentine’s menu (with or without wine pairing) and a dinner date you won’t soon forget. Dinner with wine pairing is $50 per person. Without wine pairing, $40 per person. Our full menu will also be available.